I love this, so should you! This weekend I started to believe in karma. You know what karma is. The belief that no deed, good or bad, goes unrewarded nor unpunished. I went paintballing for my friend's stag weekend at the Mapledurham Estate in Berkshire. As I was travelling straight from my second job in Newbury I was there well before anyone else and so parked up in an empty car park. After 30 minutes of trying to get a quick kip a carload of Russian gentlemen pulled up beside me. As the driver got out he SLAMMED his door into my car. My little Corsa was subject to bullying of the very highest order! Not so much as a glance from Sergei, no "sorry", no remorse on his face, not even a look from him. What made it worse was that he came back having forgotten something and DID IT AGAIN....TWICE!!!!!!! So his card was marked. I made a mental note of him and promised myself that if I were to give anyone the PJ and Duncan treatment it would be him! Unfortunately, as we kitted up and were allocated colours for our teams I found that my Russian friend was going to be on my team. Gutted. I can't shoot someone who's on my side! I may be many things but I'm not an American! So we went to the first game. Sergei and his mates were taking things extremely seriously. These boys had seen Rambo and were going to play it out on a wet Saturday afternoon in the middle of nowhere. The first game involved a fort with a flag. One team stayed in the fort and guarded it from the other team who were tasked to run down the hill and raise the said flag. I gingerly mooched around the trees which were all too small and thin to disguise me and got shot a number of times. On my right however were my Corsa-battering somersaulting Russian friends. The driver of the car which inflicted the damage to Kaye the Corsa (not my name for it, the-former-Mrs.-Green's - men do NOT name their cars) was performing a particularly amazing roll towards the target, shot up and dived for one of the screens with a little hole to poke your gun through, like they have on Gladiators. He was out of action. His mates didn't want to leave him because, as much as anything, he was their lift home and so they left the arena and made for the Royal Berkshire. Hit my car, deal with the consequences! 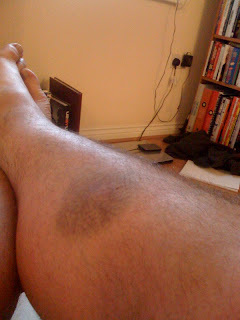 This is my paintball injury from the weekend! Every now and again people in middle management speak to their bosses and their bosses will slip into the conversation the name or names of some dull-witted management training guru they've heard about recently and then the worst thing imaginable happens. Those middle management types, because they have no imagination nor ideas of their own and want to cosy up to the upper eschelons, then read the books of the aforementioned guru and instigate the ridiculous practices they've been told to adopt on their own staff. Today is one of those days when my colleagues and I get the sharp end of this practice as we embark on "The Love-In". The idea behind it is that over the last week or so we've been compiling our own list of things about each other that we really like and we will present these lists later today. So how does that improve the show then I hear you cry? Well.......I don't know! The idea I guess is that if we know what each other likes about us we can do those things more often thereby creating a better atmosphere on the air. As we all know when you hear something for the first time (like an ABBA song) you quite like it but after hearing it 30 times in 2 days it gets boring so surely if we take all that to heart the things that endered one to another will, with more and more exposure to it, become the attributes that you find annoying? I'm all for being positive but when it's being enforced I can't help but rail against it. I hope one of the team find that an endearing quality......otherwise I'm f**ked!